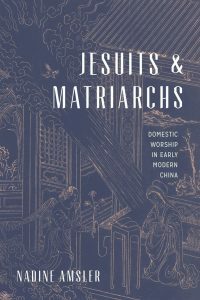 Nadine Amsler, of the Goethe University Frankfurt, has published Jesuits and Matriarchs: Domestic Worship in Early Modern China with University of Washington Press. The title is a rare investigation of “the domestic and devotional practices of women” in early modern China, according to the publishing, presenting “a rich body of evidence that demonstrates how Chinese households functioned as sites of evangelization, religious conflict, and indigenization of Christianity.” Jesuit missionaries, dealing more closely with the male elite, had only limited access to women and their ritual spaces. Amsler’s research vividly demonstrates the “networks of religious sociability and ritual communities among women as well as women’s remarkable acts of private piety” in seventeenth-century China. The titles of the chapters appear below. More information about this important publication is available at the website of the University of Washington Press: http://www.washington.edu/uwpress/search/books/AMSJES.html. Women and gender in global Catholicism.